Aviation Updates Philippines - An Airbus A320 of Cebu Pacific Air, registered RP-C3237, veered off Runway 20 in Iloilo at approximately 10:58 PM local time. The flight, carrying 180 passengers on-board performed an emergency evacuation and came out safely with no injuries reported during the mishap. 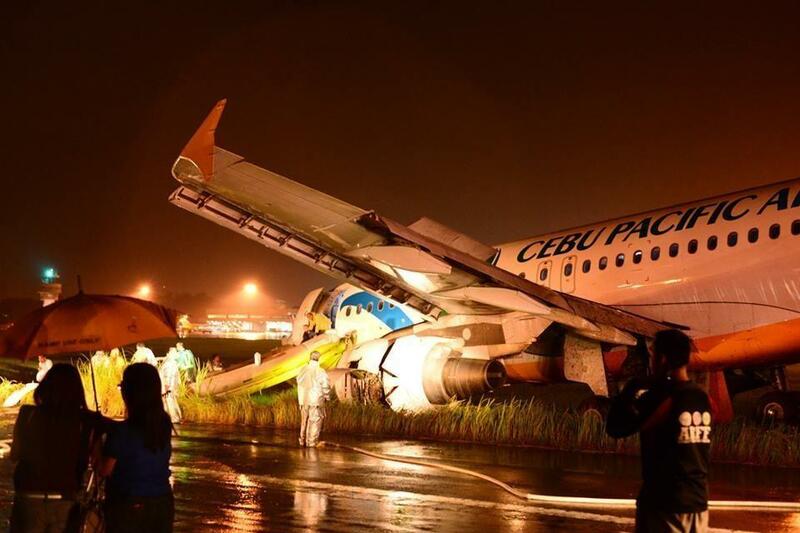 Cebu Pacific's Airbus A320 aircraft after the incident last night. Photo by ABS-CBN News. The aircraft suffered substantial damage. It was reported by local journalists that the wings broke off from the aircraft; however, based from latest images, it is safe to assume it did not. The nose landing gear snapped after it rolled through soft spots near the runway. FRIDAY THE 13TH MISHAP. Flight 5J461 came to a stop on soft ground after the landing. Photo by Loui Latoza. 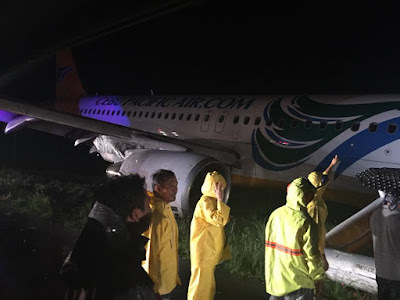 A passenger on-board, Jello Nabong, narrated his experience on Facebook where he stated that the rest of the flight was shaky and turbulent, a normal occurrence during rainy weather. It was on touchdown when he felt the aircraft bounced thrice with great force enough to bump their heads to the seats in front of them. He lauded the airline's response in the incident. The passengers of the flight were transported to the terminal via vans. 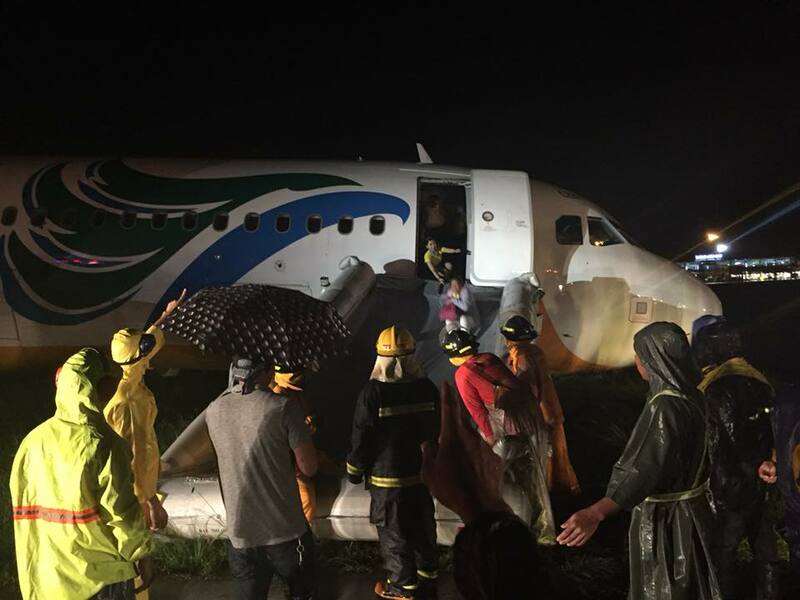 The incident severely affected flight operations in Iloilo where it had to cancel all of its flights due to the closure of its single runway. It is unlikely that the runway will open anytime soon. According to latest announcements, the airport is scheduled to reopen on October 16 at 9 AM local time after the recovery efforts are to be completed. RECOVERY OPS. 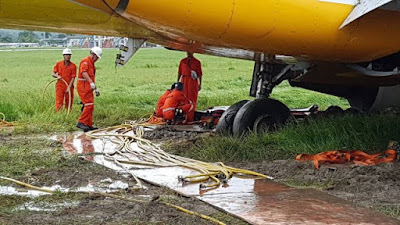 Aviation experts from the Civil Aviation Authority of the Philippines and Manila International Airport Authority join Cebu Pacific to quicken the removal of the disabled Airbus A320 jet. Photo by Rappler. The disabled aircraft has not yet been removed from the runway as of writing. Investigation of the site is still on-going. After the analysis of the incident, the aircraft will most likely be repaired and returned to service in a few months. EMERGENCY EVACUATION. Authorities help in the evacuation of passengers during the incident. Photo by Loui Latoza. "Cebu Pacific is working with the authorities to investigate the incident and expedite the re-opening of the airport runway," the airline said in a statement midnight. 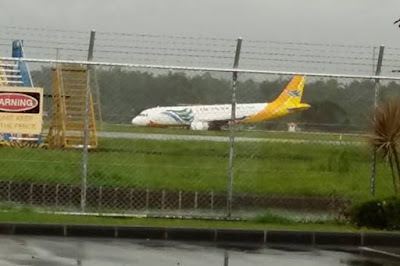 The low-cost airline assured passengers who are affected by this incident may rebook their flights for travel within 30 days from original departure date; reroute to alternate stations - Roxas, Bacolod or Kalibo for domestic flights; Cebu or Manila for the flights to and from Singapore; or opt for full refund or travel fund. Cebu Pacific assured all its passengers will be entitled to only one free-one way travel voucher. "We sincerely apologize to all our guests on these affected flights, as well as all other passengers affected by the runway closure, for the inconvenience this incident has caused, and appeal for your patience and understanding," Cebu Pacific said in a press release. Guests of other airlines may call their airline's customer service hotlines for the confirmation of their flight details. Rebooking of affected flight itineraries will also be welcomed. 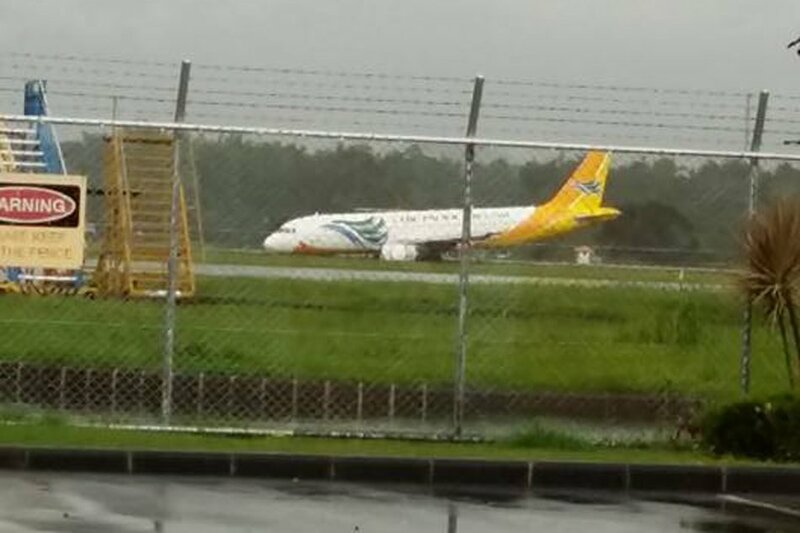 Additionally, Cebu Pacific has mounted several recovery flights for affected passengers in Iloilo. Guests may contact the airline's customer service agents to reroute them to Roxas City - a mere three-hour bus ride to Iloilo. Affected passengers may avail of the Cebu Pacific's free shuttle service/land transfer from Iloilo City to Roxas City and vice versa. Meanwhile, technical experts from the Civil Aviation Authority of the Philippines and the Manila International Airport Authority have joined Cebu Pacific to expedite the removal of the disabled aircraft. Amidst its efforts to quicken the re-opening of the airport, unfavorable weather in Iloilo hindered the recovery. Is it really a Friday the 13th for the airline? It is such an unfortunate incident for the airline due to the fact that it is one of the threatening and costly incidents since the crash of flight 5J387 in 1998. However, a quite similar incident also occurred on the evening of June 2, 2013 where an Airbus A320 (registered RP-C3266) veered off Runway 23 in Davao amid challenging weather caused by heavy rain and thunderstorms. SIMILAR INCIDENT. On June 2, 2013, flight 5J971 overshot Runway 23 in Davao. Photo by Laiza Dale A. Lacida - Rappler. It was only after fifteen minutes when the crew deployed the left-hand side emergency exit. Accounts from passengers also reveal emergency services were not readily available after the mishap. No buses were deployed to extract the passengers from the aircraft to the terminal. Davao's Central 911 rescue units were allegedly not permitted to enter the area. Passengers also complained about the poor customer service after arriving at the terminal where no staff greeted them. Nevertheless, passengers were given incentives from the airline as a token of apology. Since this incident, Cebu Pacific already adjusted and revised some of its operational procedures as recommended in a report by the Civil Aviation Authority of the Philippines. In spite of that, flying on an airplane is still one of the safest modes of transportation in the world. Driving is even more dangerous with more than 5 million accidents while air travel is only at 20 accidents. Data shared by Metro.co.uk showed that as a car passenger, you have a 1 in 624 chance of dying. However, if you are travelling by plane, you are most likely to have a 1 in 9,821 chance of dying. You also have a higher chance of death when travelling on a boat and a train. FLYING IS STILL THE SAFEST. Graph from City A.M. shows flying is still the safest way of transportation. This is an indication that passengers should not lose trust in modern aircraft. Airliners of today are already equipped with state-of-the-art equipment. Safety ratings improved hugely since the first flight a century ago. With this, aviation is one of the most successful modes of transportation coupled with unending innovations to make things safer and more efficient.